Celebrating Curves - the bridal studio devoted to curvaceous fuller figure brides in sizes 16 to 30 plus - Bridesmaids - Celebrating Curves - the bridal studio devoted to curvaceous fuller figure brides in sizes 16 to 30 plus. 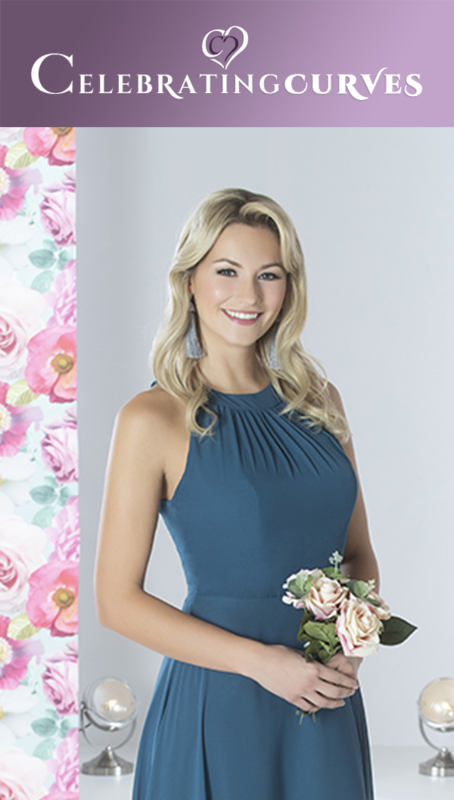 The fabulous bridesmaid's collection from Richard Designs offers beautiful innovative dress designs, with interesting and beautiful fabrics, in a huge range of colours to choose from. We have enjoyed a very successful relationship with Richard Designs, as they supply all our bridal accessories from handmade veils, tiaras and bolero jackets. The stunning collection has a dress to suit every shape and size. Prices start from £169. A gorgeous, pleated off-the-shoulder chiffon dress with gathered skirt and sparkling crystal at the shoulder. Available in any chiffon colour. Shown in Crystal Blue and Cranberry. This pretty tea-length satin and organza dress is perfect for brides or bridesmaids. The bold floral pattern is embroidered onto a soft organza, and finished with shimmering sequins. The flattering pleated bodice is made from the smoothest satin. Available in any chiffon colour. Shown in Platinum/Ivory and Ivory. The flattering cut of this bridesmaid dress will suit all your bridesmaids. A beautiful crossover V-neck bodice and keyhole back is accented with a pleated satin waistband and full pleated chiffon skirt. Available in any chiffon colour. Shown in Garnet and Mint. 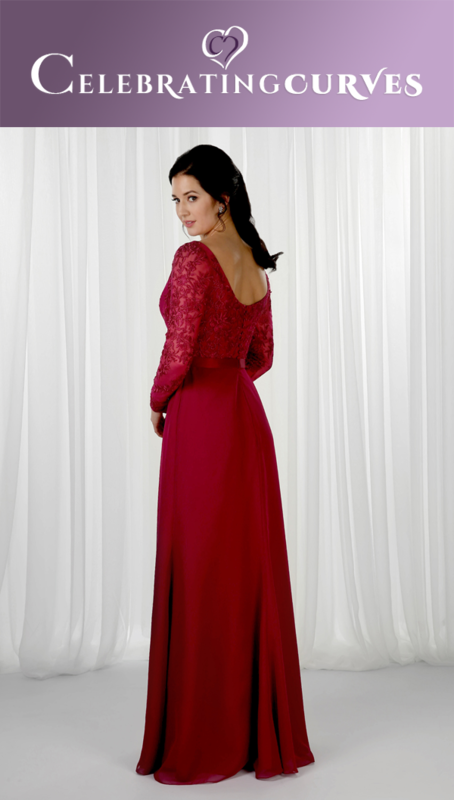 An elegant, long-sleeved chiffon gown with cross-over bodice, illusion back and full skirt with a concealed split. Available in any chiffon colour. Shown in Mint and Wisteria. 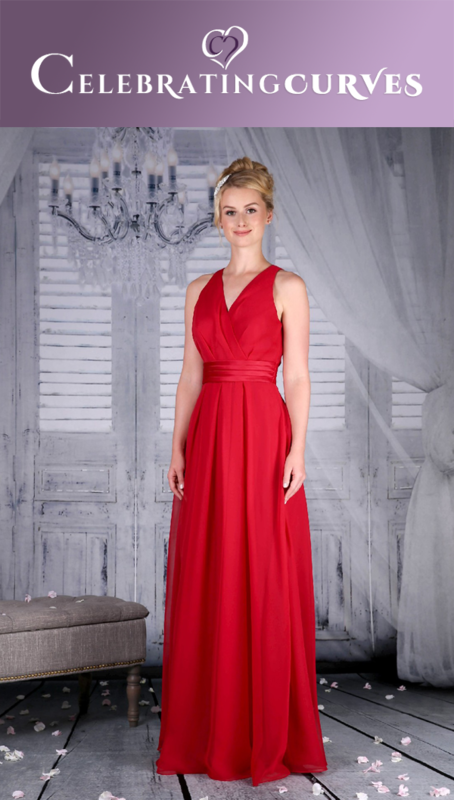 A simply elegant chiffon bridesmaid gown. The full length gown has soft gathering at the centre waistline of the bodice and skirt with a satin narrow waistband with silver brooch detailing. The V-neckline, deep V-back and narrow straps are all edged with a satin trim. The dress has a zip and covered button fastening. Available in any chiffon colour. Shown in Rose. An elegant chiffon gown with delicate asymmetrical front pleating in the bodice, V-neckline and spaghetti straps. The full length skirt has a graduated front waterfall overlay and is finished with a narrow satin waistband. Available in any chiffon colour. Shown in Platinum and Apple Red. This pretty chiffon gown has an elegant V-neck with sheer tie fasten halter neck straps and a gathered A-line skirt. Available in any chiffon colour. Shown in Cranberry and Thistle. 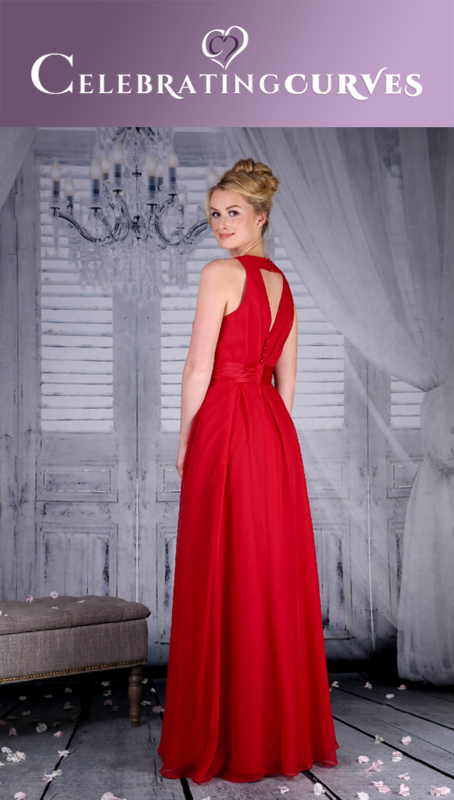 A flattering chiffon gown with a pleated bodice, sweetheart neckline and keyhole back. Complete with a lightly gathered chiffon skirt and intricate beading at the waistline. Available in any chiffon colour. Shown in Wisteria and Oasis. A beautiful chiffon gown with a flattering V-neckline with symmetrical pleating leading onto the skirt. 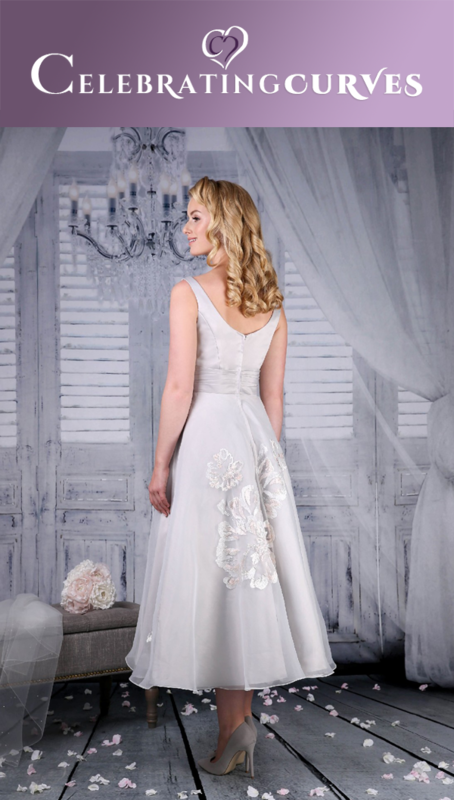 Complete with a sparkling pearl and crystal waistband and chiffon covered buttons on the back. Available in any chiffon colour. Shown in Platinium and Navy. A beautiful chiffon bridesmaid gown with a full, A-line skirt and an embroidered lace bodice. Available in any chiffon colour. Shown in Champagne and Plum. 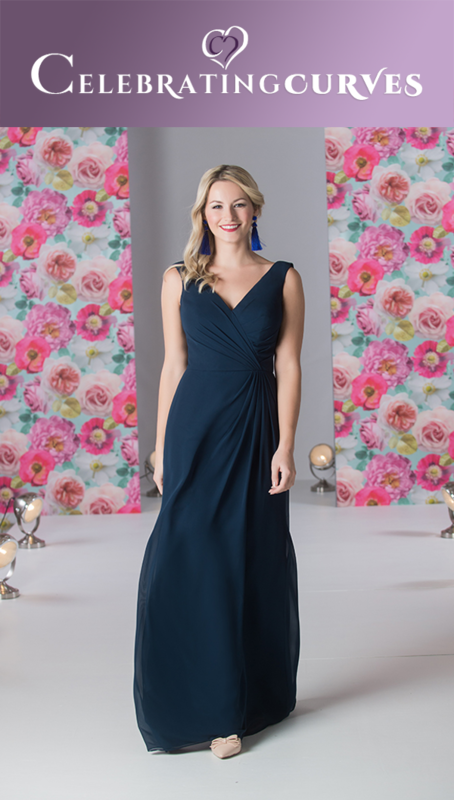 A fit and flair bridesmaid style with an off-the-shoulder satin neckline and sparkling beaded waist. The fitted skirt has satin covered buttons leading down to ruched detail on the back of the skirt to assentuate the fit and flair at the back. Available in any chiffon colour. Shown in Raspberry and Thistle. 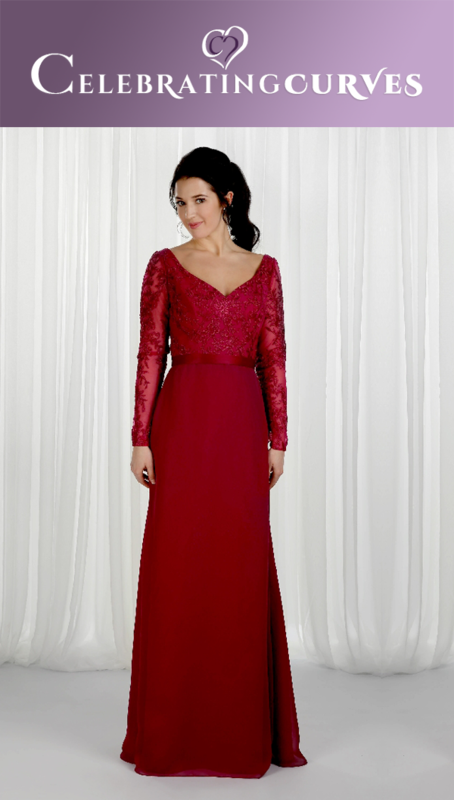 A beautiful bridesmaid gown with a high neckline and intricate beading at the waistline. The back leading to a V-back with satin covered buttons. Available in any chiffon colour. Shown in Cornflower and Violet. An elegant chiffon gown with an embroidered lace bodice with full length lace illusion sleeves. Complete with a satin waistband and a smooth chiffon skirt. An elegant bridesmaid gown with a gathered chiffon skirt and a pretty embroidered lace bodice with illusion neckline. Complete with a chiffon waistband and a scatter of sparkling beading along the neckline. Available in any chiffon colour. Shown in Crystal Blue and Violet. A romantic collection of stunning bridemaid gowns, the White Rose collection features breath-taking designs incorporating fabric such as lace, silk, soft satins, organza and chiffon. Bridesmaid dresses are designed with clever use of hand embroidery and beadwork. The White Rose collection offers a range of specially structured and designed gowns to flatter all sizes.